I have used Clint Miller Exterminating for several years now and have had no problems with their service. I originally contacted them several years ago after finding termites and they treated the house and eliminated the pests. Great company and great service! This company does a great job. Very knowledgeable and professional. I would highly recommend Clint Miller Exterminator. On time, professional, good customer feedback. Excellent Customer service. The gentleman who visited Ecil Campbell's premise was courtesy, knowledgeable and very thorough. The customer service department was great about changing the original time. They were very caring and totally understood my need. Courteous and efficient service with effective results after treatment. very professional and employees that came out explained everything they were doing before treating. You need an exterminator call them. Thank you for the awesome review and your continued business! Great company and great people. Kevin was courteous and thoroughly pleasant. Thankful to have made this company our pest control. Awesome service and knowledgeable technician. Highly recommended. Clint Miller Exterminating does great work. The technician was prompt and was professional. He completed the treatment quickly. This company has always been very professional and effective. I have used them for many years. Our technician knew his job, was polite and efficient and we haven’t seen bugs in weeks!! Makes such a big difference! Thanks CME!! Thank you so much for taking your time to review! It is awesome hearing that you are now bug free! Thank you for your business! Great company to do business with. We have been with them for several years. Won't use anyone else. Thank you for your review and for being a long-time customer! Great company always here for their customers. Was very happy that I saw no ants on Christmas Day! Miller Exterminating arrived at the service location on time as promised. They worked quickly, efficiently, and thoroughly on my rodent problem. I would certainly call on Miller should the little beasts raise their ugly heads again. I am beyond pleased with your services!! They are very friendly and courteous when they come to our house. Bobby Reynolds is as professional an exterminator as I have EVER encountered. But please don't all of you ask for him, or I won't be able to use him anymore! Could not be more pleased with our service. All employees are extremely helpful and very nice. We are so glad to be on the yearly maintenance schedule. Every time we call and need help we receive prompt attention. Can not thank you enough. Bill and Pat. 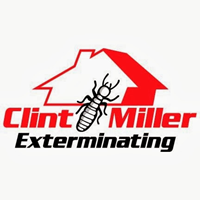 Excellent service - Professional& Friendly - Explains questions - I would recommend Clint Miller Exterminating to anyone who needs this type of service. Helpful, professional, courteous, on time. Great service at reasonable rate and on time. Polite, knowledgeable and very thorough. Great guy and I couldn’t be happier with my experience with this company. Would definitely recommend. Great Service, Professional and friendly. Would recommend to everyone! Thank you, and sincere thanks to Brent Robertson for excellent, timely service. Brent is a gifted, interactive communicator and representative for your company. I will call upon you for your services in the future. Critters are dying as promised. prompt and thorough...been our choice for many years. everything went well and we were pleased with Kevin's courteousness and knowledge of his occupation. Clint Miller is the number one choice in my humble opinion of any of the choices in our area for pest control and Exterminating. They're not only the best but the best value! Super happy with their service. Thank you for being a loyal customer and taking your time to review! We truly appreciate you and your business. Great service from Clint Miller. Tech called when he got to the house, explained what he was going to do. Did a great job communicating the options for future visits. Very satisfied. Thank you for taking the time to review our services today! We greatly appreciate your continued support. The initial inspection and spraying inside and outside were performed in a very professional manner. So happy I used them. Explained everything they were doing and the technician was so courteous and friendly.